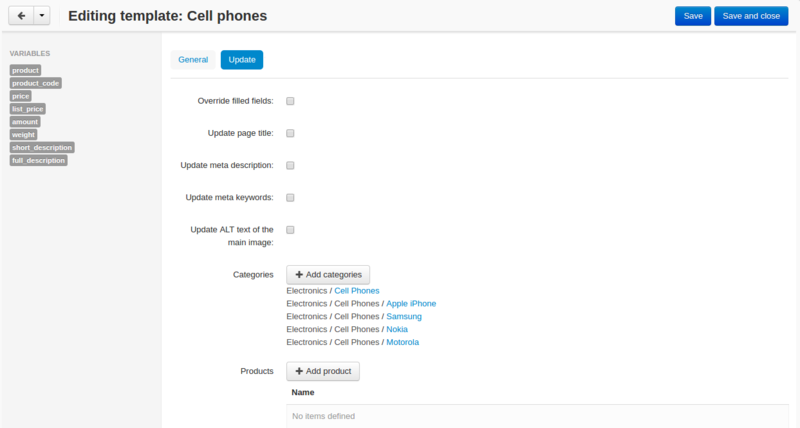 We have developed the SEO Templates add-on that allows to optimize metadata for products, categories, and pages. 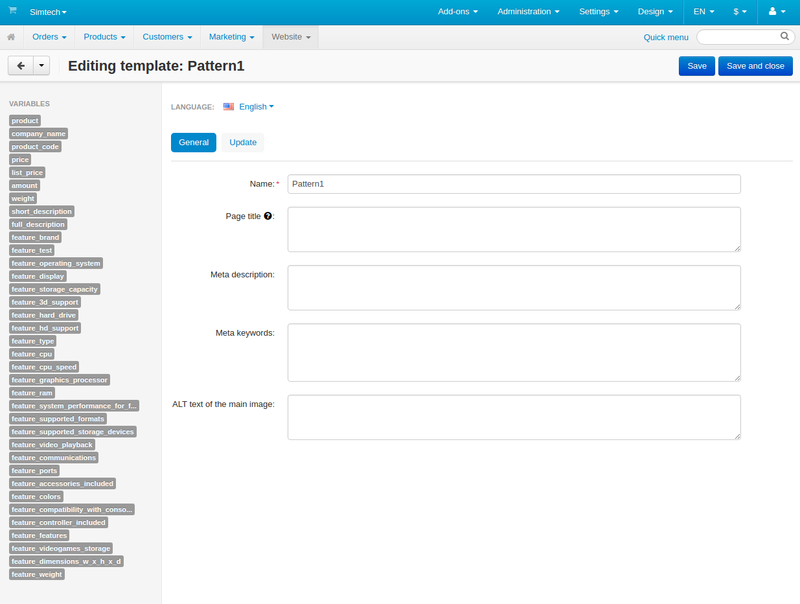 The SEO templates add-on is the template engine for meta elements. It optimizes the most important metadata for products, categories, and pages. You do not need to enter metadata manually anymore. You just create a template that will be automatically applied to the selected entities. Each template can be applied to a single entity (products, category, page) or the chosen ones. With the SEO templates add-on you will get more SEO-friendly content and better indexing by search engines. - SEO templates for products, categories, and pages. - Automatically assigned Page title, Meta description, Meta keywords, and ALT text of the main image. - Ability to overwrite the old metadata. - Ability to select the metadata that will be overwritten. - The list of language variables used in a SEO template. We will examine the possibility to add such additional variables. Thank you. Absolutely!! That was the first think I thought of when I looked into this addon! I think the Cart-Power: Power Seo enables the use of features in the seo...? We are ready to add some more variables. Product feature is the first we will examine. I do not know, you should ask Cart-Power team about their add-on. We have prepared the short overview of the add-on. It will help you to understand how the add-on works. 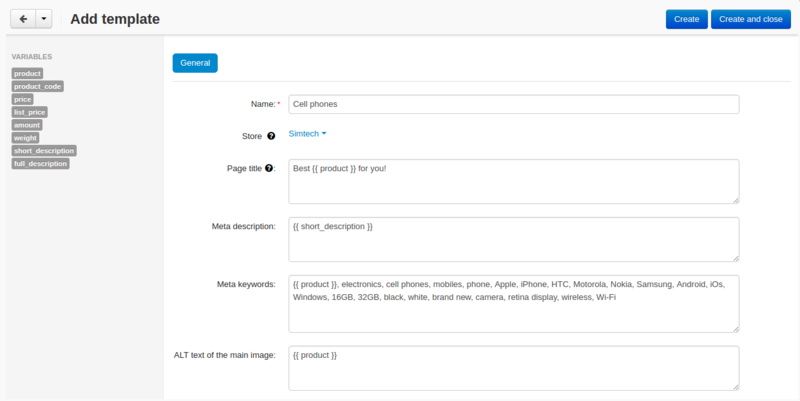 We have added company name and product features variables so you can use them in seo templates. I am very glad to hear it:) Thank you! Im in the process of purchasing an addon for SEO management. Frustrated and confused by all the different addons, all doing only part of the job..
1. The cart page for purchasing this addon seems not to have been updated with the new features. 2. The storefront Demo Site does not even use SEF URL format!... not a good look! So I guess this addon does not add Feature variants to the URL? 3. Will updates for this addon become available to integrate with SEO aspects of the new "Product Varients" functionality (hopefully applicable)? - Feature variants to the URL? - Character Count/limits for metatags, image text and URL etc. - Duplicate word checks/removal for auto generated fields, and URL. To help me make an informed decision, I would like to know the roadmap for this addon . Many SEO addons from other 3rd party devs require changes to core files, Ive read this is due in part to the lack of hooks in the standard cart. So Im guessing Simtech may have more influence over the CSC team to add the needed hooks going forward? I dont want csc updates breaking the SEO addons, nor do I entertain the idea of fixing core files after every update. Also IMO, its time for Addon Devs to offer an unlimited storefront license for cscart Ultimate. 1. Thank you for letting us know. We will update the description. 2. The add-on updates page title, meta description, meta keywords and alt text of the main image, but not the URL. 3. Most probably we will update our add-on when Product variants will be available. 4. Write your main store url. 5. We will think about your suggestions. Thank you. We did not make any changes to the core files, and, of course, we can make a hook request to the CS-Cart team. Ok, I guess I can get on with adding products,pages etc and then grab this addon when until product variants is released and debugged. You can buy the add-on now and then just install the updates. Perms are set correctly - Folders 755 and files 644. I would try the FTP upload, but what is the required "FTP directory:" setting? You can set 777 permissions, install the add-on, then set back the 755 and 644 permissions. Ok thanks, I worked it out. On previous installs, the httpd services have been owned by the same user as the public_html files. Thus It was ok to use 755/644 perms. On this new VPS the httpd service is owned by a different user:same group, so perms need to be 775/664 for any folder/files that must be written to by cscart software. I am glad to know that everything is working properly. The SEO Templates add-on is working on multiple storefronts now.